Bladder presses offer a gentler yet more efficient press with less operator effort and the ultimate in press-control. You will extract more juice and less tannins. Attach a standard garden hose to the included hose fitting. Water fills up the interior rubber bladder which expands and presses the grapes against the outer stainless steel screen. 35 p.s.i water pressure (2.5 bar) is the maximum pressure you would need to operate. Two sleeves are provided with the press. One a mesh sleeve is placed inside the press and the other is an outer plastic sleeve that is placed over the top of the press to keep the pressed fruit from squirting out. After pressing, the entire stainless basket rotates and the inner mesh sleeve can be pulled out with most of the pressed grapes coming with it. We use this press in our own small production. 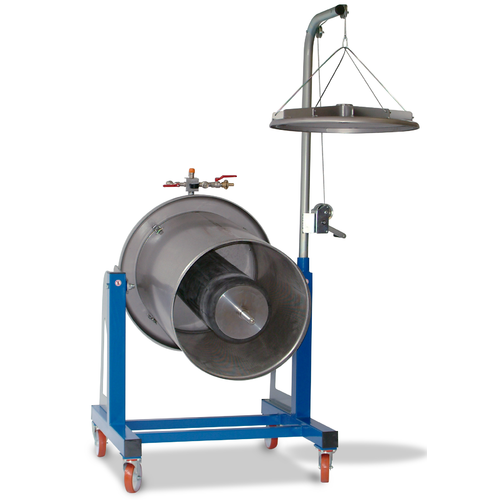 A platform was built for the press to sit on so that when we rotate the basket we can dump directly into a macrobin. 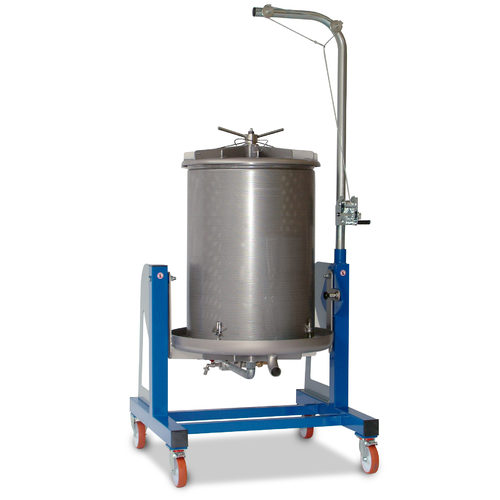 Use a Must Pump (PMP565) to pump fermented grapes up into the press. Click here for a PDF of the MoreWine Bladder Press Manual.